There are days when you&apos;re on a fishing mission, and there are days when you want to slow down your angling pace in a beautiful place. One of the best spots in Charlotte County to do the latter is Shell Creek. 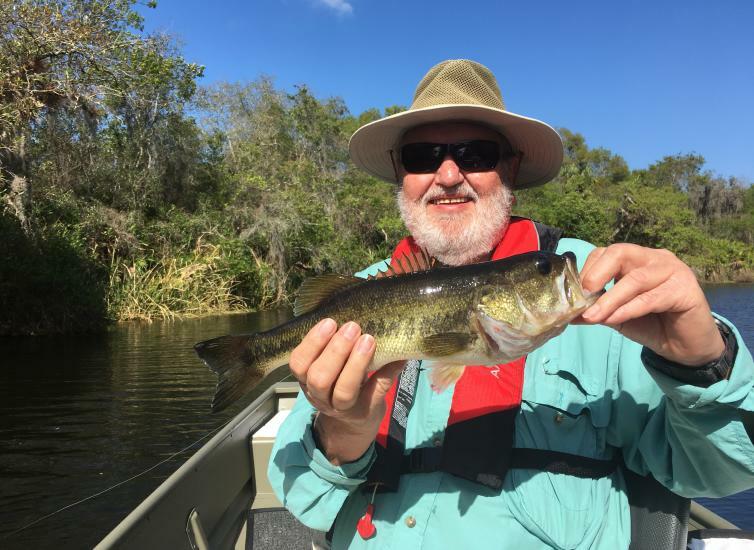 Drive 15 minutes east of downtown Punta Gorda in search of species like largemouth bass, bluegill, and black crappie. As the southernmost major tributary of the Peace River, Shell Creek is narrow and winding with plenty of good freshwater fishing spots. You&apos;ll find patches of lily pads, submerged trees, and overhanging branches -- all serving as prime fish habitat. Need a few more reasons to plan a Shell Creek fishing trip? These seven reasons just might convince you to grab your rods and pack up your tackle. 1. Launch ramps that offer easy access to Shell Creek by boat or kayak. If you don&apos;t have a kayak of your own, you can check with It&apos;s Time Kayak and Canoe, Inc. about renting one for the day. 2. You have options. After launching, you can fish five miles west toward the Shell Creek Reservoir or head east toward Shell Creek Preserve. The waters near the reservoir tend to be more productive for largemouth bass while the stretch east of Hathaway Park is known for panfish. 3. Shell Creek&apos;s waters are calm with only slight current, making it an ideal place for new kayak anglers or those who prefer a more relaxing fishing experience. 4. There is minimal boat traffic, although no shortage of scenic views. Spanish moss cascades down from the treetops, turtles bask on logs in the warm sunshine, and egrets glide effortlessly across the skies above. Don&apos;t forget to bring your camera along. In addition to snapping photos of your catches, you&apos;ll want to capture the natural beauty you witness along the way. 5. It&apos;s a great place to cast your fly rod or use artificial lures. Use topwater popping bugs (#6 to #8) on fly or 1/32-ounce Beetle Spin lures on light spinning tackle near the edges of lily pads or shoreline vegetation for bluegill. As morning temperatures start to rise, fish deeper in the water column. Switch to Clouser minnows on fly or Texas rigged soft plastic worms in green pumpkin or watermelon colors on spinning tackle for bass. 6. You might discover ancient fossils while on your Shell Creek fishing adventure. If you paddle or boat far enough upstream, and water levels aren&apos;t too high, you may notice a series of exposed shell banks. Some of these shell banks include fossils that date back to the Pleistocene period. 7. No boat, no problem. You can even cast a line from the pier that is located right next to the concrete boat ramp at Hathaway Park. After a few hours of fishing and exploring Shell Creek, you&apos;re likely to have worked up an appetite. One last helpful hint -- Peace River Seafood is an authentic Florida crab house that&apos;s just 10 minutes away from Hathaway Park.